See the top Cultural trips that go through Turkey. With 326 tours to choose from, they range in length from 3 days to 28. The most popular month for these tours is September, which has the most departures. "As the name of the tour, I had the best time in Turkey... Perfect itinerary... Tolga,..."
"Several things including st marys house"
"We had a fabulous tour. Our guide Askin was excellent and looked after us to ensure..."
"Fantastic trip. We are in love with Turkey it is so beautiful. 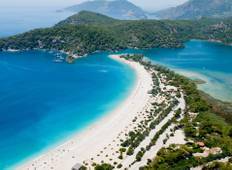 Even the Ramadan it..."
"Absolute Turkey with G Adventures is an absolutely fantastic tour! I have done my..."
"Our guide Fatih Devel and our van driver Mustafa Bostan were exceptional. As individuals..."
"In total the itinerary was V.GOOD. The accomodation at the countryside has only heater..."
"We were a family of 5 (age range of 30-60y/o). The accommodation, transportation..."
"One of the best trips I've done. Our leader Caglar was amazing, and the group all..."